When Hiryû Sôichi returns to the house of his father, together with his adoptive mother, the city of Kyôto seems to harbour a dark future for him. The old mansion, divided into a western and a Japanese part, was the sight of his father’s suicide, but it does not seem to be the only dark secret hidden in the walls in what is spoken of as the Mansion of the Dolls. The caretakers and mysterious tenants appear to keep their own secrets and the empty faces of the mannequin dolls along the dark corridors keep following him around. Strange noises, sinister pranks and threatening letters seem to aim at destroying Sôichi’s sanity or maybe even all of him. 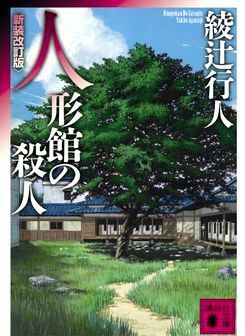 Finally I caught up with the novel that marked the turning point for Ayatsuji’s writing in his yakata-series and marked a new beginning for how the series would be constructed. It was a very interesting read, but also a very strange one, as many things that were regarded staple for the series after 迷路館の殺人 were dropped or toyed with. This makes it very hard to talk about the book without actually spoiling the central points that turned it into such a refreshing and interesting read in the end. Don’t get me wrong, the beginning is slow and it’s probably even harder to access the book in the beginning than it was for me with 十角の殺人. There is a whole load of pages waiting for you where almost nothing happens and you ask yourself where this story is headed to (okay, actually I never stopped asking that), but once the pranks start getting nastier the story will pull you in. It’s about the middle where I actually couldn’t put it aside anymore, because that’s when things start kicking off. As a detective novel this one is a strange case, but Ayatsuji actually admitted that himself. This novel was written at a point where he felt the need to change the formula of his yakata-series and he did it quite well I would say. The previous two books were both incredibly well written puzzles, with an interesting setting, a nice set of ideas and already a certain otherworldliness that made them special, especially among the closed circle stories. Yet it would have been boring if he had just continued with the same thing over and over again and while in 水車館 and 迷路館 the tricks really surprised me, I guess I would have nailed them too quickly if Ayatsuji hadn’t brought about some change. That of course means that this novel is quite different and I might not even call it a detective story in a classical sense. It is one, no doubt, but not in the same style as his previous ones and you shouldn’t go in expecting the same formula is before. I heard that many people were disappointed exactly because he broke that formula, but I think a series’ worth is proven when it can actually take some change and still be entertaining. In that way it also serves as an interesting link between his old works and 霧越邸. You can see how he tried out some things, some worked really well and some he seems to have ditched again for his later works. Especially the way the characters were written was totally different now and the jump to the more developed cast of 霧越 doesn’t seem that strange anymore. In his previous work most characters appeared to be more of a necessity to carry the setting and the trick along (even though of course a few of them were great), but most of the characters in this one had a certain kind of dimension to them, which made them seem more human and less like a stageprop. Don’t get me wrong, I love Ayatsuji (he’s among my most favourite authors), but him before and after this novel are two very different writers concerning style and I have quite different expectations for the next novel 時計館の殺人. ~ by seizonsha on 2010/12/25.